this is getting better and better i love it!!!!! Awesome! Glad you’re enjoying the comic! AHAHAHA the background crowd faces made my day. And Angry! Johnny. I also adore the amount of tiny detail on this page. Al the instruments and clothing are so beautiful. 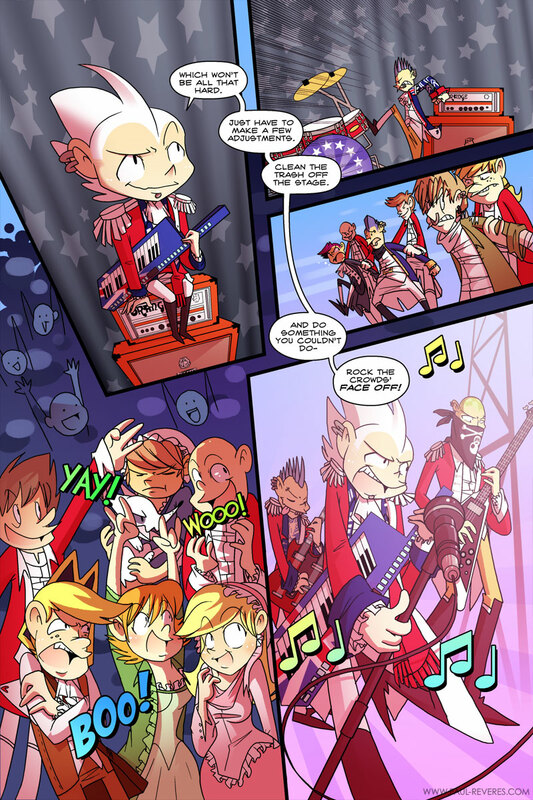 The “battle” pages always take longer for me to do because of having to draw all the characters and their instruments. And, yeah, I like drawing the random audience members to a certain point. When I tire of it they all get derpy faces in the back. Hehe. LOL. Y’know, I think Johnny might be down for that. Oh noooo I couldn’t take him away from Paul like that, Paul might get lonely!! JENNY!!!!!!!!! JOHNNY!!!!!!!!! DEHAAAAAAAAAAAAAAAAAAAAAMN! XD THIS IS GLORIOUS! It’s like every one of Benedict’s statements could be punctuated with a guitar riff.